Our High Definition Security DVRs will provide the user with the highest resolution recording and viewing capabilities. These DVRs are all capable of recording HD-TVI, AHD, or standard analog format and at least one ONVIF compliant IP camera, our 5-in-1 DVRs adds the ability to view and record HD-CVI cameras as well. All the video recording formats support both 720p and full 1080p recording resolutions and our new 5MP All-In-1 Security DVR series supports up to 5 Megapixel HD-TVI resolution. The difference in formats is mainly in how the video is encoded for transmission over the coax cable but the quality of the live and recorded images displayed on your monitor are essentially the same. The Hybrid HD-TVI Video Recorder lets you use a combination of standard analog cameras with HD-TVI cameras. All the same features and high definition recording using HD-TVI cameras but with the conveinence of using your existing analog cameras. This allows you to upgrade gradually to all HD cameras whenever you want. Remote access from PC or mobile devices, available in 4, 8 or 16 channels. The 5-in-1 HD video recorder is compatible with HD-TVI, AHD, CVI, analog and ONVIF compliant IP cameras. Offers recording resolutions up to 1080p and 4 audio inputs, available in 4, 8,16 or 32 channels. The 5MP All-in-1 Security DVR provides a step up in recording resolution for HD analog cameras. This DVR series will work with all camera formats however 5 Mega Pixel recording will require our 5MP HD-TVI cameras. Fully backward compatible with all resolutions so you can keep your existing cameras and upgrade as you need or all at once. Computer or mobile device remote access with cloud P2P, available in 4, 8 or 16 channels. The 8MP 4K Hybrid+ DVR provides our highest recording resolution for HD analog cameras. This DVR series will work with all camera formats up to 8MP resolution. Fully backward compatible with all resolutions so you can keep your existing cameras and upgrade as you need or all at once. Computer or mobile device remote access with cloud P2P, available in 8 or 16 channels. The two small images below look very similar in quality due to their compressed size as you may see on a quad screen or small monitor playback. However clicking on the image for a larger view shows the amount of pixels is insufficient in the 700 TVL camera and produces the pixelated images we see many times on the news. This can be a critical difference between clearly identifying a criminal or evidence. 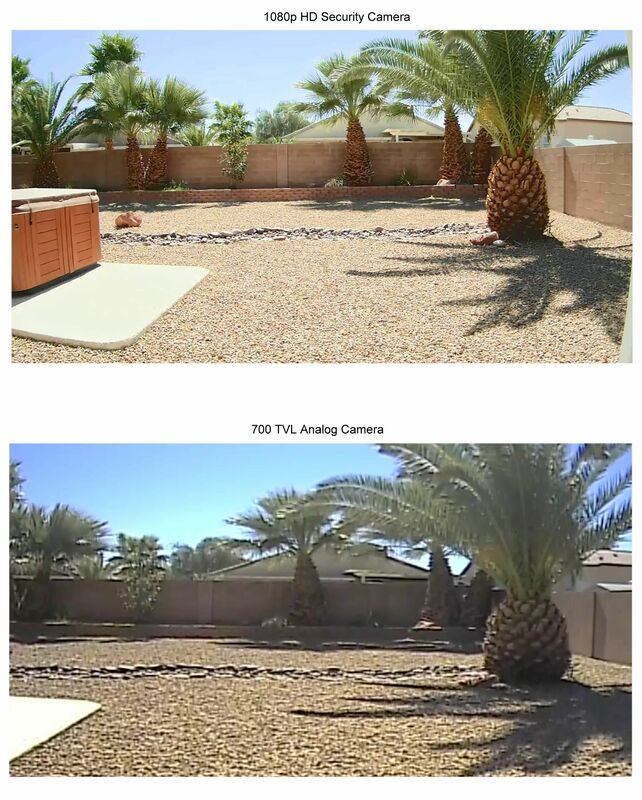 Both images were recorded on the same HD-TVI DVR and both slightly reduced to fit onto the page. Also notice that the standard high resolution image stretches objects such as the base of the palm tree. This is because standard cameras are 4:3 aspect ratio and not 16:9, so when viewed on HD TVs or monitors the image is stretched to fill the screen.